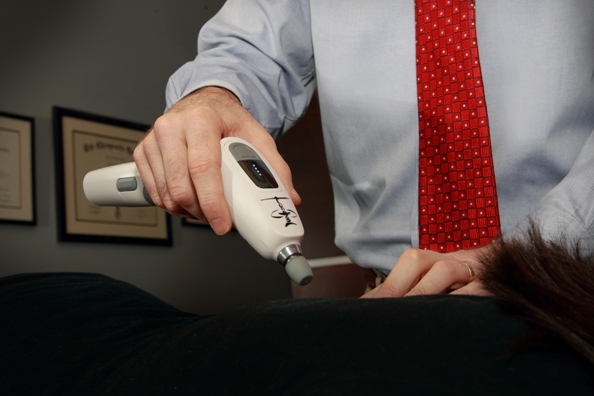 Your chiropractor and thousands of other doctors around the world now use the Activator Adjusting Instrument® in the care of their patients. This patented and FDA registered device was specifically created to deliver gentle and precise chiropractic adjustments to the joints of the spine and extremities to relieve pain and restore function. Activator adjusting is a tried and true technique developed to provide controlled treatments to the specific areas you’re having trouble with. Our chiropractors use the Activator Adjusting Instrument to provide this treatment rather than the traditional manual methods. Activator adjustments are high-tech.There is no popping or cracking with these adjustments , but rather very precise and targeted adjustments designed to specifically care for just the right areas. Your chiropractic doctor will consult with you about your health and perform a complete examination to identify your problem areas. You’ll be given a report of the doctor’s findings and an opportunity to have all of your questions answered. Chiropractic adjusting with the Activtor Adjusting Instrument® aims to restore your body’s balance and function to correct the underlying cause of your symptoms with treatments that are as painless as possible. Getting you back to feeling yourself again quickly and effectively are our primary goals. What does it feel like? Chiropractic adjustments with the Activator Adjusting Instrument® feel like a light tapping sensation on the area that is being treated. In most cases the treatment is painless and after the adjustment many patients feel relief of pain and improved mobility. Others report a sense of well-being or a soothing calm feeling. Of course, results vary from case to case and chronic conditions, inflammation or muscle spasms may delay these positive effects.